I don't think it's a secret that 1. I love Disney and 2. I love the food at Disney. And whether you're using a Dining Plan or just paying as you go, the food to be had is amazing. In particular, the snacks at Disney are magical. A lot of them you can only find at Disney locations and I think that helps to keep it special (and also drive all of us crazy who don't live near enough to have it very often). 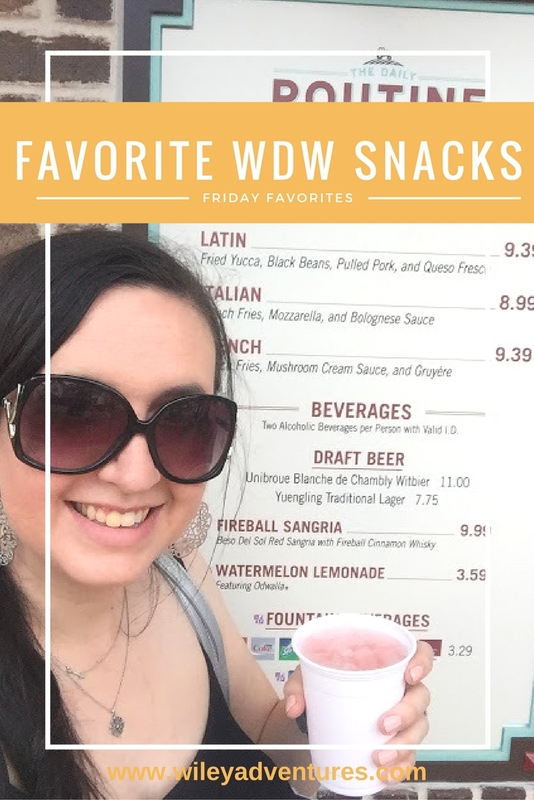 Anyway, I thought I'd share my favorite snacks with you today for Friday Favorites! This treasure is one of those treats that you can only find at certain Disney resorts and at the Dole Plantation in Hawaii. Dole Whip is pineapple soft serve ice cream and you can find it in Adventureland at Aloha Aisle behind Aladdin's Magic Carpet ride. I recommend going as soon as they open because the lines can get long! (At WDW, you can also find it at Captain Cook's at the Polonesian Resort). Guys. This one I dream about. This cinnamon sugar goodness can be found at the "Launching Pad" in Tomorrowland (and also at Fife and Drum in the American Pavillion in Epcot). If you need a little sweetness while you ride the people mover or wait for Monsters Inc. to start, this will do the trick. Also if you just love yummy cream cheese sugar cinnamon goodness. You won't be sorry. We stumbled upon Lafoos Brew on our last trip and it was the PERFECT afternoon refreshment. It's a sweet apple juice, caramel drink that is so tasty! We couldn't get enough of it! Also found at Gaston's! OH MY GOSH THIS LITTLE SHOP IS A SLICE STRAIGHT FROM HEAVEN. Located in the Germany pavillion, I dare you to pick a favorite thing. Ok, just kidding, I actually do have a favorite. The chocolate covered caramel with sea salt. But the other offerings will not disappoint you either! (Archer clearly gave his stamp of approval). Another place to get the cream cheese pretzel is at Fife and Drum located in the American Pavillion in the World Showcase. This was a surprising find for me to be a favorite. But we LOVE popcorn and it was conveniently located in Future World when we needed a snack. They had a few different flavors and we tried (and enjoyed) all of them. It was something we could snack on throughout the day and even take back to our room with us that night. There are several things to snack on at the Harambe Market. I love the chicken skewers and the Watermelon Lemonade. The theming of this market is so neat and is a favorite place of ours to sit in the shade for a few minutes and have a snack and a break! We discovered the Chocolate Mickeys on our trip in 2013. You can find them at Zuri's Sweet Shop. They are solid chocolate in milk or dark chocolate, and they have banana chips inside! The cupcakes at Hollywood Studios are to die for. You can find them at several places in the park, but check out the ABC Commisary for some special themed options like the Darth Vador Cupcakes :). Located near the Landing in Disney Springs, this little place of goodness will make a trip to Disney Springs worth it if it's all you do. Dare I say, I liked it better than The Karamell-Kuche. It's really neat to see in the window to watch them making this special treat! The Aristocrepes Cart in Disney Springs offer both sweet and savory choices. The Strawberry Romanoff was amazing and gone in 60 seconds. Is your mouth watering yet??? Hopefully you will find this helpful or like me daydreaming about your next Disney trip!! For more Disney Food Ideas, check out My Favorite Quick Service Dining Food. For more travel tips, help planning your next vaction, or just for fun, check out my TRAVEL PAGE, or email me at carrie.wiley@keytotheworldtravel.com. I'm linking up with Momfessionals, Grace and Love Blog, and Little Bit of Everything Blog for Friday Favorites! Join Us!